The Bermuda Environmental Sustainability Taskforce [BEST] said they were “alerted this morning to a notice in the Official Gazette that the tree behind the old Magistrates Court building on Reid and Parliament Streets was to be removed”. BEST said, “While the wording in the official notice clearly refers to removal of the tree, the Minister has assured us that the plan is not to cut it down but only to prune it. “We have been hearing from our supporters a sense of disappointment that so many of the remaining trees, in the City and beyond, are being slated for severe pruning or complete removal as though they were totally dispensable. We have advised them that the tree is only going to be pruned but it is clear that the concern is growing for Bermuda’s diminishing stock of significant trees. “We remember the Poinciana tree at the end of Serpentine Road that was cut down without notice. And it seems this kind of precipitous action was at least being contemplated here. Except for the obligatory tiny ad in the newspaper to close the street, we have been given virtually no notice of their intention. “We deserve better. One by one the trees that keep Bermuda from being totally urban are being picked off. This has to stop. These actions, purportedly being made on our behalf but excluding us from the process cannot continue. “We have to ask what is wrong with this kind of thinking? Can’t we solve a relatively minor problem without having to destroy trees in the process? 1] Cease any plans to remove this particular tree without reasonable consultation. 2] Halt any plans to “remove”, cut down, eradicate or in any other way do away with mature trees in the City without giving the public adequate notice and a reasonable time in which to consider and respond. 3] Change the thinking that devalues trees and replace that kind of thinking with policies and practices that recognise the true value of trees, to our landscape, to our well-being, to our tourism product, and to the economy as a whole. I can accept tree pruning but removal of a tree is simply not on. Do we really need Bermuda’s Capital to look like any other City devoid of trees….NO! And by “pruning” they mean some COH hacks who know nothing about trees, chopping bits off indiscriminately. Not sure of how they arrive at those values.. But yea I am no tin favour of deforestation of the city.. WTF is the mayor thinking? The mayor and his cohorts don’t think,they are only interested in themselves. The CoH should be disbanded,it is surplus to requirements. Chris Famous, I can see the advertisement now. Young nesters apartment with great views and cool breezes. Environmentally friendly and made with natural materials and recycled plastic debris. Locally made. $416.66 per month for a bird nest for 50 years. Convertible to duplex at $213.33 each nest per month. Long lease terms available. Bermudian birds preferred, although PRC’s considered. Assessment number available. Unfurnished, utilities not included. Is Atlanta devoid of trees? nor is London,Paris or New York,but try removing a tree in any of those Cities and see what happens. If by ‘pruning’ they mean chopping off all the branches, as they did to that once beautiful tree on Gorham Road (near the Marine Locker), then pruning is just a euphemism for killing. Leave our trees alone! Anyone can make up imaginary numbers to scare people. This kind of untruthful environmental propaganda undermines BEST’s message. Very different numbers that those from BEST. BEST does wonderful and outstanding work for Bermuda. I hope the published numbers were simply an error. Maybe BEST adjusted figures to represent Bermuda numbers. For example, only this Monday I saw watermelons at a roadside stand in Maryland for $3 each. Watermelons from Pennsylvania in a local market yesterday, $15 each. Same size. 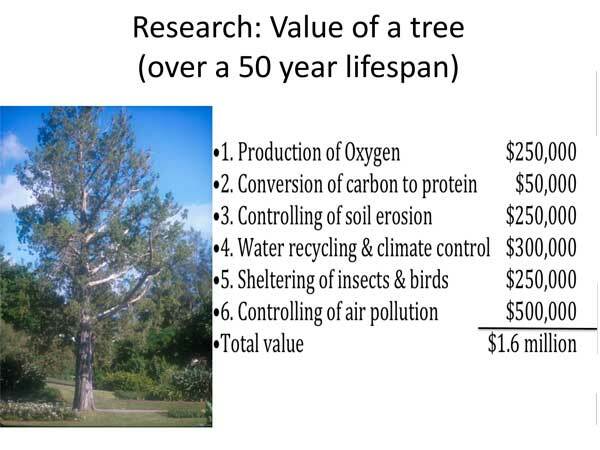 Using the same markup to arrive at a Bermuda price for the value of a tree BEST is not too far off. Totally agree with the recommendations, but please enlighten us as to where these figures come from? Must be that the skinks and birds are paying rent! What is happening to the cedar tree opposite Henry’s Pantry? All of a sudden it is dying,what is causing it to die? If it is a casaurina, pepper, fiddlewood or any other nuisance tree, chop it down & grind out the root. If cedar, prune only as absolutely necessary. i agree …there should be a hitsquad put on the invasive and destructive mexican pepper…ban mexican pepper trees…search n destroy them useless bandits. IF you are that serious about trees try ensuring those landscape Companies prune hedges properly and not use machetes and trim hedges at the wrong Angle creating dead undergrowth and trees taking longer and suffering to heal its self. I just wish BEST would stop being so selective but I am sure they will not come out and say anything about this. I’d have to say,we need more hemp trees,gottah makemaown rope! Hemp is medicinal and great fun to enjoy with a tawny port,or chiante,or remy martin….and cartoons,news,disney,harlequin romance,history channel,discovery……and it provides a revinue,it is an anti inflamitory as well. When there is a clear danger of a large tree or tree branch coming down in a hurricane on a house or a passing car/bus potentially causing serious injury/fatality one has some sympathy for the point of view of those who’s liability it becomes when tradjedy strikes. Now it cannot be beyond the wit of a moderately talented tree surgeon to take a few pictures and write up a little authoritative documentation on the merits of removing a potentially dangerous branch or whole tree, to justify an action before it is taken. Such things it seems are called for in the sophisticated little jewel of a democracy called Bermuda. Dead still summer afternoon: Without warning two ton poinciana branch comes crashing down on a miraculously empty footpath, crushing it’s low walls and laying waste to the path below. What happened? Termites let go hands. Imagine their dismay if a tourist happened to be on the path, it did after all actually occour on a guest property in St. George’s. There are merits on both sides, and there ARE two sides. Let’s cooperate and work it out. We can do it, peacefully, no demonstrations/marches/spilt blood required. And what do we do when we remove a tree that was potentially dangerous? That’s right, we REPLACE IT!!! Why? For all the good reasons BEST have given us. Humans used to think like BEST about trees long before we had universities and scientists and before we were so knowledgeable. Now this was before we had so much pollution and so many people aboard the planet. Some folks, quite recently as time goes, have called those people back then, dumb wild savages. Oh but they had beautiful trees, whole forrests of them, and they actively maintained their forests until people who called themselves civilised popped up and sorta took over. Well the civilised folks have, some of them, finally caught up with the savages, can now write scientific papers to justify behaving toward trees pretty much the way savages did before they were wiped out by the civilised people who didn’t yet know how to take care of trees. Kinda sums up the history of trees as handled by the cousins next door. Having just read this thread, it is unfair to fault the Corporation. The CoH are responsible for closing the road, but the Parks Department, has coordinated the pruning of the tree. The problem is that the overhang of the branches over the building causes the leaves to block the gutters. As a result, there is constant seepage into the building, and the ceilings have been falling down inside the work space. The pruning is a health and safety issue. I advised BEST before their release that the CoH notice was incorrect, and that the road closure was for pruning, not removal. I am a little disappointed in the tenor of the BEST press release, especially since they knew of the intent well before hand. They contacted me and had the response within the hour concerning the situation. I observed part of the exercise this morning and am satisfied with the care taken by the Parks workers. While the roof of the building will be examined again, there has been too much public money expended in the renovation of this building to allow the tree to constantly undermine the safety of the workers inside. Patricia Gordon-Pamplin,you assured Stuart Hayward ONLY pruning was taking place can you explain why a lovely mature tree, on the other corner of the building just 20 feet away, has been cut down? Perhaps the Parks Department can justify it’s removal. I walked away today from the scene with a piece of healthy tree in my hand saddened that its long existence has come to an end. So seemingly unnecessary and sad. Why can they not construct a small wire mesh cage over each gutter to stop them clogging up with leaves, instead of cutting down or pruning to destruction (many trees do not recover from excessive pruning) these mature trees which take decades to grow and offer many benefits, which at the very least is providing a natural beauty to a city and island which is slowly resembling a concrete jungle as more open spaces get bought up and built on. This is not a difficult solution and probably cheaper than expending the resources to cut down these invaluable trees! As BEST says we do need to have a respect for trees…to often we take them for granted, like our reefs and an innumerable amount of our other natural resources.